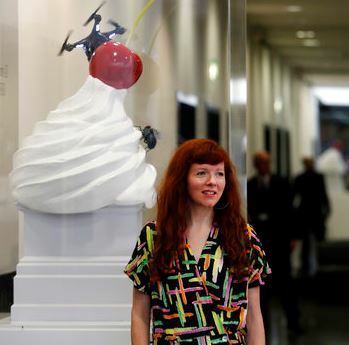 LONDON (AP) — The next two artworks to be showcased on the Fourth Plinth in London’s famous Trafalgar Square have been selected. The art platform is currently home to a giant bronze thumb, but will be replaced in 2018 by a recreation of an ancient sculpture destroyed by the Islamic State group, it was announced Tuesday. 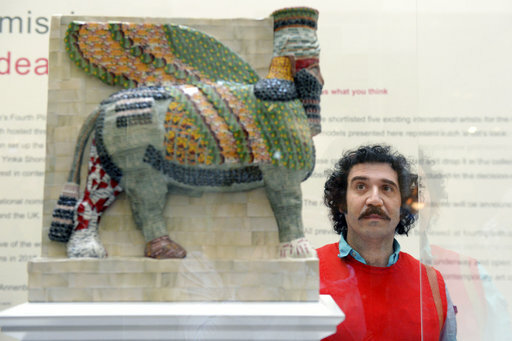 U.S. artist Michael Rakowitz will make the statue of Lamassu, an Assyrian protective deity in the form of a winged bull, from empty date syrup cans. In 2020, Lamassu will be replaced by a giant ice cream sundae, topped with a cherry and the more unusual additions of a drone and a fly. British artist Heather Phillipson’s creation The End has an interactive element and visitors will be able to live-stream the view from the drone on their mobile phones.